This is another in a series of little hand warmers for 2012. Even though winter has not officially arrived for us in the Land Downunder, it has already send envoys on unexpected days to remind us how "brr" it can get. The the "brr" is always a good incentive to get the mind and fingers onto making winter woolies. Anyone into handmade crats will truly enjoy the uniqueness of this piece. Hot coffee and warm toasty hands & fingers with a touch of romance and Lace - what could be better on a mournfully cold day?! 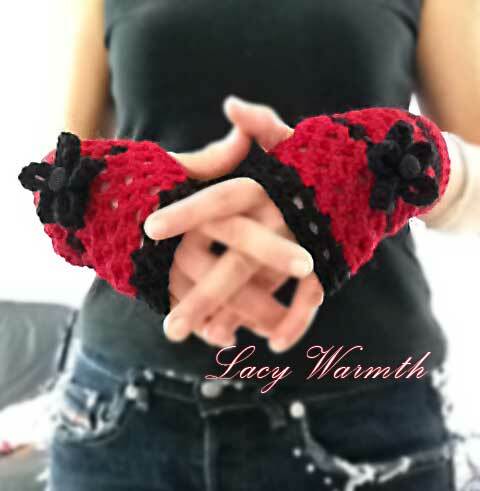 I am just putting down some notes on the making of these lacy fingerless gloves. It will make more sense if you already know some basic crochetting. The main stitch used throughout is "scallops" made of 5 chains. And then you build row by row with the same 5-chain stitch. Here I wanted a pair of gloves that was a bit firmer at the base (around the wrist) and a little bit more snug and less prone to stretch over time. So I started with few rows of simple double crochet and worked a rectangular piece. The circumference should fit snugly around around the hand & wrists. The number of stitches are the same as for the body as I will be doing no increase along the length of the entire gloves. The rectangular piece will form the "band" for the wrist and will later be "closable" with a button. 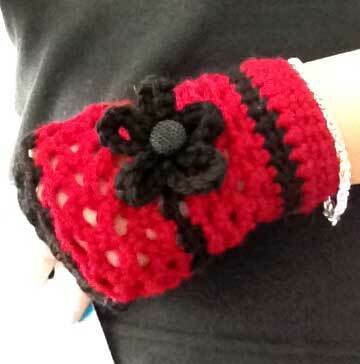 The rest of the gloves is worked in the round, in the 5-chain stitch to produce the lacy scallop look. 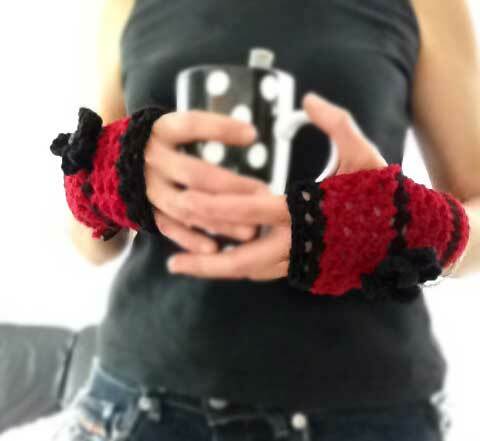 I used Cascase, 100% Peruvian Highland Wool for this pair of fingerless hand warmers. 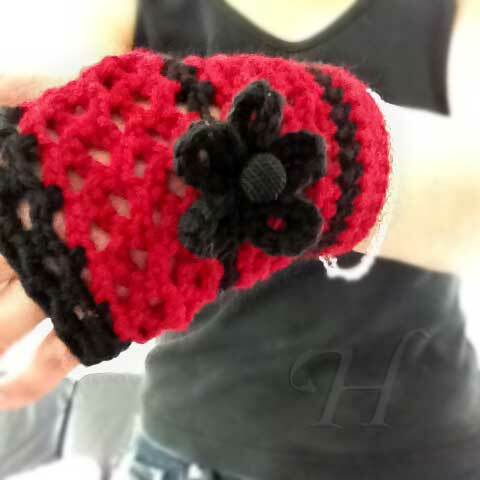 I made a black crochet flower for each side, accented with a textured button. This is to be sewn on during fitting to ensure that the flower looks centered. Select closure buttons. Make fitting look on the band of gloves. 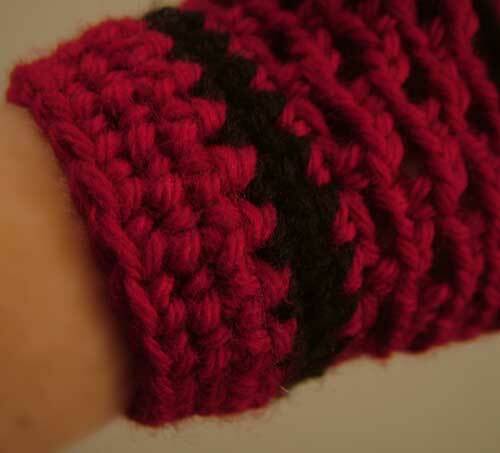 Then firm the look with a row of double crochet. The flower is optional. 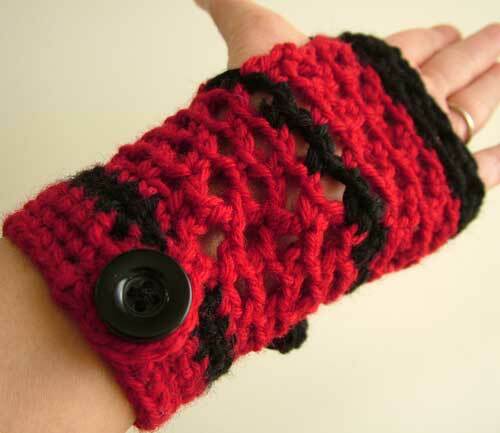 It can be placed on the band or near the fingers. Each will produce a slightly different look, depending on personal preference. The Red Black contrast is dramatic, bold, and visually warming.